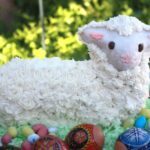 An Easter Lamb Cake is a popular centerpiece in many Polish homes. It’s a tradition that followed the Polish diaspora to the United States. If you want to try one, I have the recipe and decorating ideas, my own and others. In the Gospel of John, Jesus is referred to as the Lamb of God, a phrase that’s used in Christian prayers and liturgy. Since the Middle Ages, the visual image of the lamb has most often been depicted holding a pennant or banner of a red cross on a white background, which represents the Risen Christ. Another common accessory for the lamb is a red ribbon around its neck. the color representing the blood of Christ. In Poland, the lamb makes many appearances at Easter. In addition to the lamb cake, there are also butter lambs that have been carved or molded, and sugar lambs are a popular treat for children. The 3-D lamb cakes are made by baking in a 2-part cake mold. Some are fortunate to have antique cast iron pans that have been passed down in the families. Modern cake pan makers Nordic Ware and Wilton both make a lamb cake mold. I bought the Nordic Ware pan on Amazon. Polish Housewife participates in the Amazon Associate program, and purchases via Amazon links below generate a commission. I’ve used my favorite pound cake recipe. It’s a dense cake that strong enough to keep its shape and the ears attached as your decorating. I find this a simple recipe, but if you prefer to use a mix, be sure it’s a pound cake. Most moist, pudding in the mix, cake mixes have a texture that’s too soft for this 3-d cake. Whatever cake you’re using, let me encourage to you use this Polish trick when preparing the pan. Butter the pan and then sprinkle with (unseasoned) breadcrumbs. It guarantees perfect release from the pan. You’ve probably seen this photo making the rounds on Facebook and Pinterest showing the perfect lamb cake and, shall we say, a more rustic version. 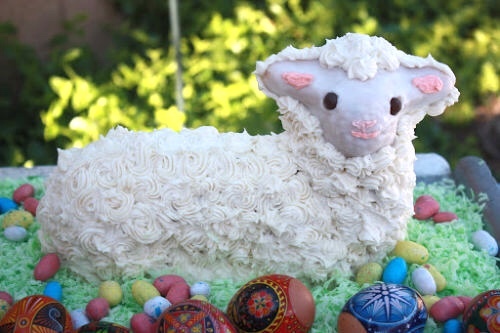 Don’t let it deter you; follow my lead and you’ll have a no-fail Easter Lamb Cake! Liz from FarmWifeCooks.com presents three options for decorating lamb cakes. I especially like the simple sophistication of her cake dusted in powdered sugar and with sugared berries. I used her technique for dipping the face in a glaze for a smooth finish and no broken ears from trying to spread frosting on them. I’ve opted for swirls of piped buttercream because I just enjoy piping, and I can always use some practice. Structurally, the weakest part of the cake will be the ears. Retro Ruth has a suggestion on how you can add support to this vulnerable area before baking the batter in this post. Something I read too late, and thankfully didn’t need. As for the eyes, I had originally purchased a bag of licorice jelly beans, which we ate before I made the cake. By the time I replenished the jelly bean supply, the only thing they had was a mixed bag of jelly bellies. Which turned out to be perfect, I could have used black, but I think the brown looked better. You might also choose to add something to your plain molded pound cake. One option is to carefully slice the body of the lamb cake into thick layers horizontally, spread a thin layer of warmed jam (makes it more spreadable) or a scant layer of lemon curd in between the layers and reassemble before frosting. The decorating process shouldn’t be rushed. A chilled or frozen cake will be stronger and hold up better as you’re applying whatever you decide to do. 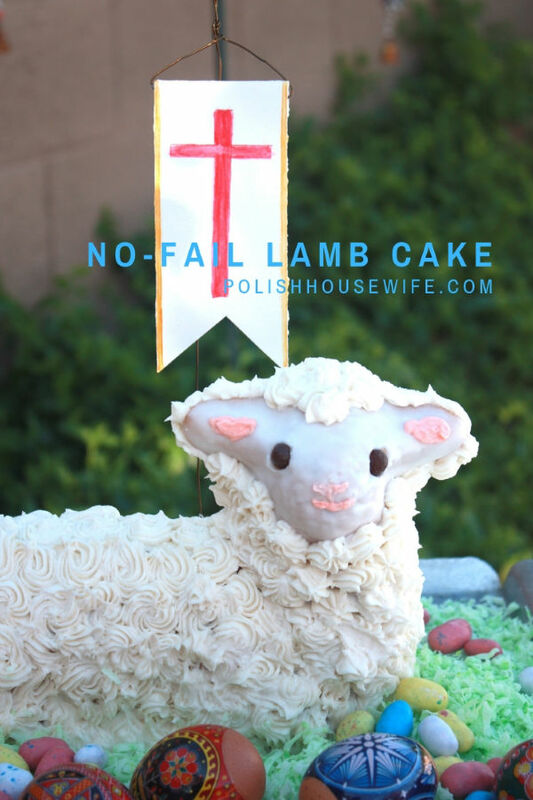 Soon after I piped a row or two underneath the lamb’s chin, the frosting slide down about an inch – into the fridge with the cake and the piping bag for about 5 minutes. I just piped new swirls where they belonged. This might have happened because the glaze of the face was not completely dry. Whether you’re serving a lamb cake or a mazurek, I wish you and yours a joyous celebration.